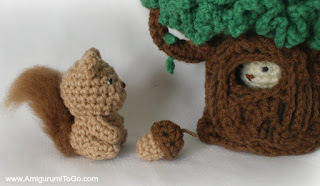 I designed this tree to go with my latest free patterns, Lil' Trouble Teddy and the Tiny Squirrel. The tree can hide 4 little bears and squirrels inside, then pull on the strings and close up the top of the tree. All the little friends are safe and sound inside! I also designed pouches in the leaves that will hold the little bears and squirrel in, like a nest, they can sit up in the tree and look around. If you use brown for that part it will look like a nest! All the patterns in this series come with full video tutorials as well as written patterns. *There is a full video tutorial for this tree. It is in two parts. See part one for the tree trunk and the base (pouch part) of the leaves. I show each row, 1-22, in part one of the video. Skip over what you don't need. *optional: cut a circle from the plastic mesh canvas and sew it to the bottom of the trunk. OR glue in a piece of cardboard. Make sure it fits inside with the edge of the last row up and around it so you can carry on with crochet without any troubles getting into the stitches. * do not worry if you are out a stitch or 2 after this row. The final stitch count will not affect the final outcome of the tree. Next ch65 with green and f/o leaving a bit of a yarn tail to work with. Weave chain in and out of row 22. Tie yarn tail ends together, add a bit of glue to the knot to keep it from unraveling. Cut yarn tails up shorter. There are lines made up of loops going in a spiral to the top of the tree. Skipping the first row of loops, insert green yarn into the beginning loop of row 17, ch3 and 1sc into next loop, repeat this around and around until you reach the end of the spiral .This will take some time, take breaks when you need them! Please view part two of the video tutorial if you need help. How to add the leaves is at the beginning of that video. Branches: there's 3 sizes. You don't need to make all 3 if you don't want to. Feel free to play around with the number of branches and also the length of them. If the branch goes on the outside of the leaves, add a few leaves to the top of the branch before sewing it to the tree. Add leaves by inserting the hook at the tip of the branch, ch3 and sc into the next space, once you reach across, so one half of the tip has leaves, ch3 and turn, repeat across. Do this on one side, the other side will be sewn to the tree. 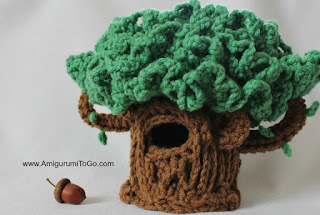 The shorter branches can be sewn to look like they are going up into the tree and don't need any leaves added. Again, I show this in part two of the video tutorial. f/o leaving a long tail fore sewing. Roll tight and sew edge to keep it together. f/o leaving a long tail fore sewing. Roll and sew edge to keep it together. There's 2 different ways to add texture to the exterior of the tree trunk. I show both in the video. Method 1 is using sc and hdc along the surface. Insert the hook anywhere and add any design you desire. You can use straight or curvy lines and also go over the lines you put in with more sc or hdc. Play around with it, there's really no wrong way to do this. Method 2 is to make a large branch piece. Do not roll it, instead pinch the middle together and weave in and out along the part you pinched together. Once you weave to the other end, pull the yarn tail to make the bark bunch up a bit. Sew that piece, the narrow end towards the top, to the trunk of the tree. There's no real right and wrong way to assemble. It's just what is easiest for you. If you plan to add on bark using method 1, you might find it easier to do that before you put the branches on. I show how to sew the pieces together in the video, please view that for helpful tips. Again, adding bark is optional. I like the extra details but it's totally not necessary! The tiny leaves hanging off the branches: ch2 and sl st the 2nd ch from the hook. f/o and sew to branch. Beautiful tree. Here they can play hide without being found. He seems to me a bit like a magic tree. Lol lol ... my imagination already runs away ... Successful tree! no I don't but I SO wish I did. I was raised in Canada and my parents spoke English at home. So sad about that. One day I hope to learn though! It's a really fantastic tree!Thank you to share the pattern! This is the cutest little thing I've seen forever. What a wonderful imagination you have. So creative. Good work and thank-you so much for sharing it with us all. God Bless you. I thought I left a comment but I'm not sure if it went through so I'm making sure by doing it again because I want to make sure you get it. I want to tell you just how clever this little tree is. You are a very talented young lady. This is THE most cutest and cleverest little thingy I've seen in a long long time may be EVER and I'm a designer of gift items retired. Did it professionally. I've been crocheting for soooooo many year's. My mother taught me. I'm 73 so my dear I just wanted you to know that this item shows a very creative and talented young lady. Your little animals are just darling. Thang you for sharing your talent with us all. God has blessed you with a wonderful talent. sorry, I have no idea. I don't upload pdf to this blog. In the past I used google drive then provided a link to the pdf here on my blog. Hi Sharon. First I want to say I love your work! It's so amazing! My question is... What yarn can I use if I don't have the opportunity to use the red heart yarn you are using? I would just suggest finding a yarn similar in weight or something close to it. Well, any yarn will work but to get it this size then use a 10ply (or close) and the hook size I suggest. You can also double the yarn strands if you only have a light weight yarn on hand. This pattern is amazing. Very unique, thanks for sharing! amazing. no words to say. Thanks for sharing the pattern. Are you still planning on releasing the little Acorn too? Would love to add that before I give these to her. This is an unrelated question to this particular post but I didn't know where else to ask my question. I think you had said in one of your other posts that you take requests so I was wondering if you've ever considered making a pattern for the new snuggle sacks that are very popular these days. If you don't know what they are, they're basically like a sleeping bag in different shapes like a mermaid tail, shark, pizza, etc... I would be very interested in one of these and would even be willing to pay for the pattern if you could do it. There are a lot of these patterns for free on you tube but as a beginner to crochet, you seem to be the only crochet artist I can actually understand and get items done. So for that I thank you because you are GREAT! Anyway, I hope you consider my request and thank you in advance. Suggestions can sometimes be worked into what I'm working on, or added to a set I'm working on. I can't take requests but I can add them to a very long to-do list I have. I never made a blanket before, or a sleeping sack. I only make amigurumi. I'm afraid I wouldn't even know where to begin! So sorry about that. Have you ever tried the "Crochet Crowd"? Mikey does his patterns on video too and I believe it was last year he did a series of those blankets. Thank you so much for the kind words, that really means a lot. I'm so glad you find my patterns easy to understand and follow. Thank you so much for this pattern :) It was a pleasure making the tree (I will upload a picture on your facebook page). I didn't have the plastic canvas and used 2mm green felt instead and it turned out really wonderful. Thank you! What is the reason for family tree creation? For what reason would you set out to make a family tree, or even compose the ancestry of your family?